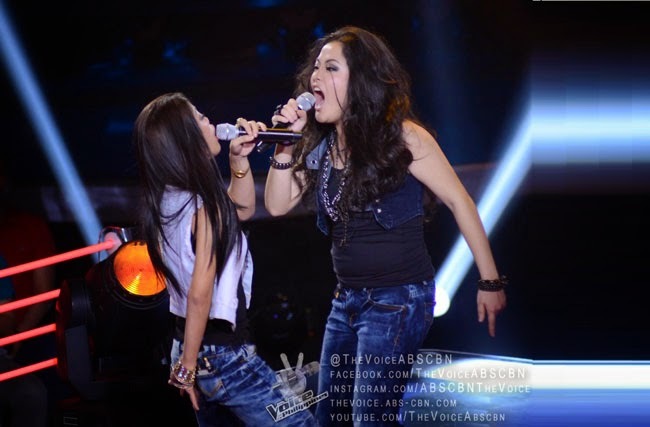 Team Bamboo Tanya Diaz and Shaira Cervancia sing “Banal na Aso, Santong Kabayo” as their piece to convince their coach in the Battle Rounds of the Voice of the Philippines season 2, December 14, 2014. The 27 year old rock star, Tanya Diaz, came from a family of music lovers. Her inspiration is her late brother who is also an musician. Diaz is the first ever four chair turner in the second season of The Voice of the Phillipines, with the song ‘What About Love’. She had chosen Bamboo as he is one of the famous rock icon in the country. Palawan’s Shaira Cervancia had chosen ‘Sabihin Mo Na’ as her piece to get into the Battle Rounds. Being a vendor in her aunt’s store, Cervancia dreams for a better future, especially for her younger sister. The coaches agreed that her natural voice was great but she had to unlearn some singing habits. The Battles Round Result: Cervancia faces the four chair turner Diaz. Cervancia said that she believed Diaz is better than her but she won’t back down without a fight. Diaz also said that the younger singer has some unique talent in her. She also admitted that she was not comfortable with the old Tagalog rock. During the rehearsals, Cervancia shared that she was having goosebumps as she practiced with Diaz. Lady rock stars from Team Bamboo performed the classic, “Banal na Aso, Santong Kabayo”. The coaches gave the standing ovation to the artists. Lea simply said ‘Wow’ as her initial reaction. She said both gave their hearts but picked Cervancia. Sarah rooted for Diaz but admitted that she was unable to move and seemed stunned during the performance. Bamboo said that both are versatile and he welcomes the fact that he had a hard time to decoded who to keep. The rick icon chose Diaz. Cervancia went up for steal and the other three suddenly pressed their button. Apl said he need her energy in his team. Lea said that Cervancia’s grow as an artist was great and she want to continue Bamboo’s job. Sarah said that Cervancia must remember her as she was one of the coaches who turned for her during the Blinds. Cervancia chose Sarah to be her new coach.